Some dwarf species are close in size to Syrian hamsters, while others are tiny little things that can fit between the bars of a normal hamster enclosure. Size alone, therefore, isn't a reliable indicator of whether your hamster's a dwarf or a "regular" subspecies. Coloring and behavior also help determine whether you've got a dwarf in your hands. Measure the hamster. A dwarf will always be smaller than a Syrian hamster, which is about 5 to 6 inches. A Campbell's dwarf and Djungarian hamster -- closely related -- reach 3 to 4 inches at maturity. Smallest among dwarfs is the Roborovski dwarf hamster, maturing between a tiny 1 and 2 inches or just a smidgen larger. So while Roborovski dwarfs are significantly smaller than Syrians, Campbell's dwarfs and Djungarian dwarfs can appear somewhat close in size to them. Look for a solid black vertical stripe running down the middle of your hammie's back. Both Campbell's dwarf hamsters and Djungarian dwarf hamsters sport this stylish stripe that begins at the top of their heads and runs almost to the bases of their tails. Neither Syrian nor Roborovski hamsters have this stripe. Look at your hamster's colors. 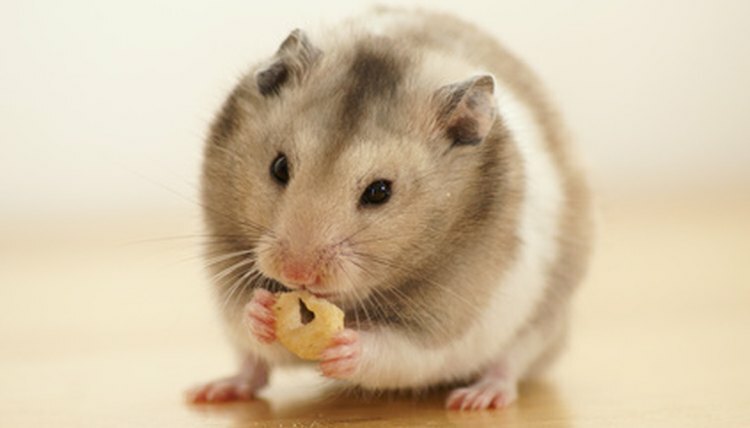 Syrian hamsters have white bellies and golden-brown coat shading. Sometimes the white wraps around their back. A Roborovski dwarf hamster sports a sandy brown coat along most of its back and a bit of white underneath. The little hammie also typically has a bit of black mixed in, especially around his ears and head. Some have entirely white faces. Djungarian dwarf hamsters normally have dark gray coat along their top side and a white belly. The gray along their top side may appear lighter gray when they're young. Some borrow a few tricks from chameleons in winter and turn entirely white. They turn back to their normal color after winter. A Djungarian doesn't always become white in captivity, though. A Campbell's dwarf can come in a lot of different variations, from a standard dark-grey-and-white, similar to a Djungarian, to a completely black coat. Pay attention to your hammie's activity level. Dwarf hamsters have things to do, wheels to run on and tubes to climb into. They're usually more active than Syrian hamsters, who are more laid-back and easygoing. Observing behavior isn't a foolproof way of determining whether you have a dwarf hamster, but it can help when taken into consideration with your hammie's size, stripes and colors. Dwarfs also tend to get along better with other hamsters, so cohabitation is sometimes a possibility.  Djungarian hamsters are also known as Russian winter white dwarf hamsters.  If you scour the Internet, you'll often see information that suggests Djungarian and Campbell's dwarf hamsters are the same. They are not.  Although more uncommon, Chinese hamsters also exist. They, like Campbell's dwarf hamsters and Djungarian hamsters, have a black stripe that runs down the middle of their back. They're noticeably different than dwarfs or Syrian hamsters in that they're thinner and have a longer tail. They're about 4 to 5 inches long. Chinese hamsters somewhat resemble a rat.